Daughter of the Burning City is one of the most unique books I’ve read in a while. The whole setting of a travelling – as in actually moving – circus and/or city is enough to blow your mind. Whilst the details of the world outside Gomorrah are wishy washy, the Festival itself comes alive on the pages. Foody’s writing is very sensory and emotional. I craved kettle corn throughout the whole thing, and I’ve never even HAD kettle corn before. (Feel free to send me some, kthanxbai). Plus there’s murder, and magic, and what more could you want!? The two main characters, Sorina and Luca are adorbs, and I really enjoyed the way their relationship developed. It was real and organic, and so very unusual of YA. Speaking of unusual, the diversity in Daughter of the Burning City is brilliant. Sorina herself is bisexual, her sister is a lesbian, and Luca is somewhere on the ace spectrum. The best part? It’s not heteronormative at all. Kudos, Foody. Sorina’s family was a little bit more… Meh. I couldn’t quite get to grips with them all. One of the deaths upset me, but I think it was more to do with who they reminded me of rather than the character itself. I practically forgot Hawk existed at times. As for the murder mystery, it was fairly obvious to me who it was from the beginning, but it didn’t take away from the reading experience, personally. The one thing that bugged me is why Sorina could see without eyes. It felt a little pointless, giving a character a disability and then fixing it with magic. I get that Foody wanted Sorina to be viewed as a bit of a freak by others, so as to isolate her a little, but it seemed she took the easy way out by making Sorina blind while not having to actually write from the point of view of a blind person. But I guess that’s a bit of a nit pick…? I dunno. I just don’t SEE the point. (Getddit?… Sorry.) I think I would have accepted it more if the only reason wasn’t because magic. 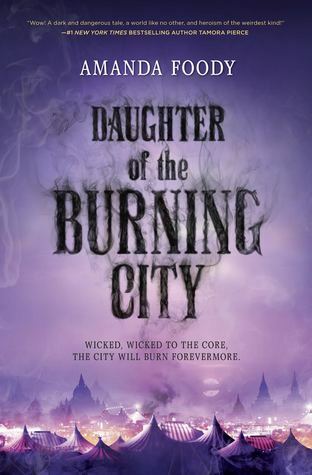 Daughter of the Burning City was one of my favourite reads of the year, a worthy debut, and I can’t wait to read what Foody comes up with next! Buy it, borrow it, skip it? Buy it! Perfect for: fans of Caraval and The Midnight Circus.